Our good friend, of whom we have seen very little recently, but who persists as an unwitting gastronomic inspiration to us – Juan Camilo – struck again recently when we spied a mess of veal brains at our local butcher. [I’m not sure what the proper collective noun is for brains, but the term seems appropriate given their form, even if something like “florettes” might be more marketable.] We are forever indebted to JC for introducing us to and instructing us on Colombian food, but also for taking us to Ali Kabab Cafe, happily for him, just across the street from his Astoria, Queens, apartment. This celebrated, only in New York, hole-in-the-wall, 5 table, nominally Egyptian restaurant is run by the enigmatic, tri-lingual owner, Ali El Sayed, on the back of one tiny assistant, an oven and a single hot plate. These limitations combined with a menu that you should ignore in favor of the daily specials and Ali’s rather, shall-we-say, changeable moods, make for a unique dining experience, during the latter stages of which we were presented with a platter of deep-fried veal brains decorated sparsely with salad greens, a thin harissa sauce, and lemon wedges. This rosy, if slightly hazy memory (made so by several bottles of heavy Algerian wine), was instantly recalled upon sighting said brains and my hand sprang to pocket, promptly unencumbering it of three and a half of your American dollars. It was only at home, several hours later, after this initial enthusiasm had cooled, that I was left to consider how to make the best use of my grey matter. I should point out that this is not an uncommon occurrence and in the past, the excited purchase of unusual foodstuffs has frequently prompted breathtaking swerves of culinary daring, as seen in these here web pages, – an outcome I was particularly counting on in this instance since the four pound ox heart I also sneaked into the shopping cart had taken up all available room in the freezer. But as I sat and stared at them – the passing minutes becoming quarters and then halves of an hour, the milky whiteness of the brains reflecting my mental vacuum back at me, echoing the blankness of my thoughts – nothing at all, even less than usual, sprang to mind. In fact, had not this vacuity coincided serendipitously with the harvest of our very first eggplants (2) and the watching of the TiVo’d episode of No Reservations in which Tony goes to Naples and eats a remarkable eggplant parmigiana, the brains might have been squeezed into a dark corner of the freezer and consigned to a lengthy hibernation. Inspiration doesn’t always have to take you all that far to rouse you from your stupor, and in truth, I made no greater mental leap than removing the greens, lemon and harissa from that dish at Ali. If Ali’s brains and rudimentary appliances had provided him all that was necessary, I reasoned, there should be no impediment, barring inferior technique and lesser quality ingredients, to my own mental faculties doing likewise. Besides, I was certain that scrambled or boiled brains wouldn’t have any photogenic quality whatsoever. 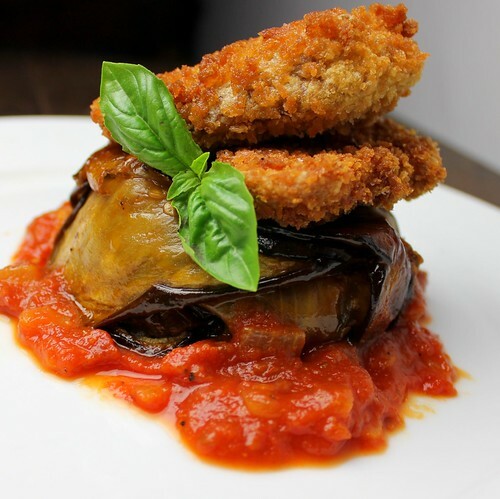 Thus, the dish you see before you is a play on the combination of eggplant parmigiana and veal or chicken milanese: a roasted eggplant-wrapped package of red sauce and mozzarella seats a pair of breaded and deep-fried brains in cross-section. For anyone still reading, I want to be clear that, certainly, I am sympathetic to those for whom brains might be an anatomical bridge too far. Had I not been in an expansive (read:tipsy) mood at Ali, I doubt I would have been so bold, though I am glad that I was. (In the interests of full disclosure, I should add that Juan Camilo did not find the brains to his taste.) Similarly, I am sure that even if it is interesting to them, it will be no incentive whatsoever to the skeptics, to learn that predators, including our very own ancestors, often eat the brains of their prey first, leaving the rest of the carcass until later so as to make sure they partake of the most nutritious parts before anyone can take it away from them. Nonetheless, we swear that veal brains are the new sweetbreads – which may mean nothing to you unless you’re accustomed to a little nose to tail eating – they are mild, firm but almost creamy in the mouth, and have very little of the minerality typically found in organ meats. Despite only the remotest of chance that you will, we (as always) encourage you to give brains a try. They are by no means an everyday foodstuff and definitely demand a mental leap, but isn’t it true that almost anything really rewarding requires some thought? Salt eggplant slices well and place side by side on a cake rack sitting in a sheet pan. Cover with another sheet pan weighted down with some heavy books. After 20-30 minutes remove weights and carefully remove eggplant and pat dry. Discard liquid. Rub a sheet pan with olive oil and lay eggplant out flat. Season with black pepper and another good dash of olive oil. Bake in oven for half an hour. Remove eggplant and allow to cool. While eggplant is baking, in a saucepan on medium, saute onions until softened, 4 minutes, before adding onion and red pepper flakes. Cook another 3 minutes, stirring occasionally, before adding tomatoes. Bring to a bubble, before reducing heat to a gentle simmer for 20 minutes. Slice veal brains into palm-sized slices, 1inch thick, and with flour, egg and breadcrumbs put them through the 3-stage breading process. Line several oiled ramekins with eggplant slices and place mozzarella chunks in the middle. Top with a tablespoon of sauce before either folding eggplant slices around cheese and sauce or placing extra slices atop. 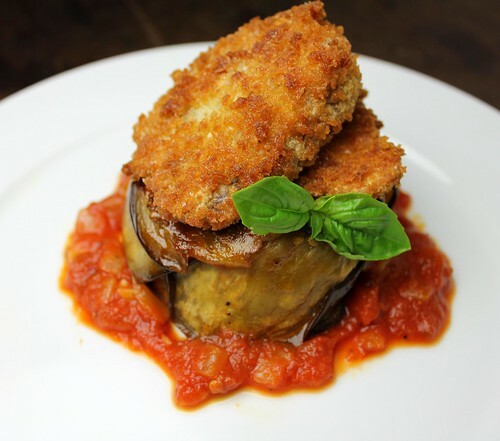 Place ramekins in oven for 15-20 minutes or until eggplant on top is browned. Deep-fry veal breaded veal brains until golden brown and crispy all over. Remove to a cake rack and sprinkle with salt. Carefully un-mold eggplant, plate with fried brains and another spoonful of red sauce. Enjoy with a good dry white wine. If someone had told me as little as 5 years ago that I would eat lamb’s stones I would have keeled over. But I have and they were delicious. I love sweetbreads but have never tried brains. You pique my curiosity. 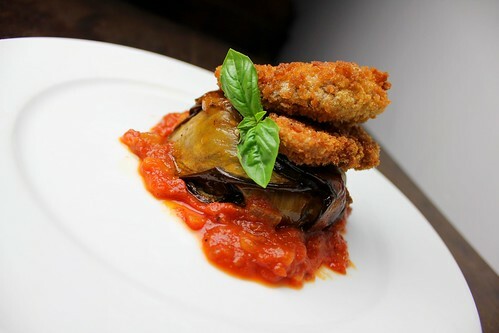 The combination looks rather decadent, doesn’t it… with that crisp and creamy brain and the dreamy eggplant. Time to cross another culinary bridge. I also must try out Ali Kabob… many people have recommended it. So, my lovely husband didn’t mention how delicious those individual eggplant parms were the next day heated up and served with an arugula salad. In fact, I took a pic of it, but, like many other food photo sites, it wasn’t “accepted”. But if the brains aren’t your thing, the eggplant parmigiano, layered in small ramekins with a creamy mozzerella present inside, is worth making while eggplant season is in full gear. Do eating veal brains make you smarter? Love eggplant but I think the brains may be too big a leap for me. But it looks yummy. I probably would have tried it had I not known what it was. Sigh. 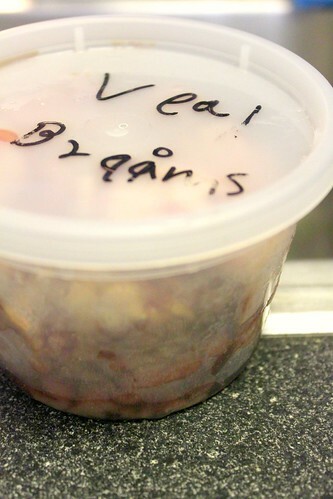 I saw the tub of veal brianns and got all excited. But no, this is a post about brains. @Heather: sorry to disappoint. You can only imagine our dismay when we got them home and figured out what they really were. @Nonna: Of course they do. Just like eating fish makes you a better swimmer. What did the brain taste like? I know what the texture is like, but I forgot how it tastes…? @Bob: it’s hard to describe but it has a mild almost sweet flavor, somewhere between veal meat and sweetbreads, I would say. I love this post. I’d eat your brains (not really “your” brains, the brains in your dish) in a “heart” beat. Love that you consider photogenic quality. I do too. Ha! Well, we’re bloggers after all…My dinner menu absolutely has visual components, though not every day. While this does look delicious, I am not sure that I am ready for brains just yet. I don’t eat brains but it surely looks delicious. You two are such braniacs! I wish I could come to your house for dinner…this looks really good….I’ve never had them but I would love to try brains! I don’t know if I could eat brains unless I was bitten by a zombie first. BRRAAAIINNNSS!